Mail Box is a third party Application Made for iPhone and iPod touch , it is basically a mail client that handles and delivered Gmail Messages to your iOS devices, Application has been made Available at iTunes on 8 Feb 2013. 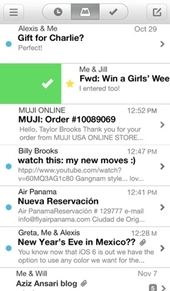 Mailbox is an entirely redesigned inbox that makes email light, fast, and smartphones responsive. Quickly swipe messages to your archive or trash. Scan an entire conversation at once with chat-like organization. Snooze emails until later with the tap of a button — they’ll return to your inbox automatically so you can focus on what’s important now. 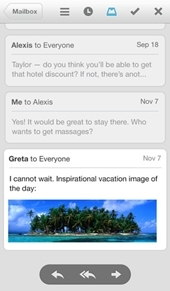 Mailbox checks your email from the cloud, and then transports it to your iPhone securely. You can even get push notifications for new messages. Add all your Gmail accounts for immediate access. Mailbox currently works only with Gmail; Orchestra the development company of Mail Box App said that more e-mail platforms are coming soon.